Picking operations for order fulfillment are one of the most expensive warehousing functions and thus a critical area for close evaluation and process optimization. Did someone say, “Carton Flow Rack?” Ok that may have been us, but seriously while carton flow rack may not be the best choice for all your hand-picked inventory, it is a great solution for most of it, and here’s why. Inventory stored in less efficient static shelving or rack may waste picking time, travel time and rack space that could all be better utilized. Carton flow rack can streamline your picking operation and free-up valuable storage space for better inventory flow. Carton flow is less costly than automated systems and significantly more cost-effective than static rack for the right inventory. Carton flow is a dynamic storage solution most often used for each picking, and some full-carton or case-pick applications as well. What is warehouse slotting/Why is it important? How can carton flow help with product slotting? Easy reprofiling using snap-on guides and dividers. First, identify your fastest-moving SKUs that are fulfilled individually as “eaches”. You are looking for the largest number of picks vs amount of stock or inventory. Your fastest-moving SKUs have a high average pick per day. Next, for carton and case picking you are looking for your medium-range fulfillment SKUs, i.e. inventory that is picked perhaps weekly. Those SKUs are likely your best use of picking from carton flow. Conversely, cases and cartons that move very fast are often best suited for picking directly from the pallets… we can recommend a good pallet flow application in those cases. Pallet flow can provide much of the same benefits that carton flow offers but for faster-moving carton and case picking. Lastly, be sure to frequently analyze your order picking activity to ensure that your carton flow rack (and therefore your picking function) is optimized. Mallard carton flow is uniquely designed to make reprofiling easy… so don’t fear frequent slotting analysis. There are a few other optimization techniques that can be implemented to further reduce your picking operation costs and most effectively utilize your storage facility. Clearly carton flow optimization and slotting methodology can be a complex grid of fast, faster, and frequent inventory mix. It’s best to discuss your specific inventory and fulfillment needs with an expert to ensure you are getting the most efficient use of your space, carton flow rack and warehousing staff. Choosing Mallard gravity flow experts to design your carton flow application will not only guarantee top-of-the-line products and creative ingenuity but each proposal will contain individualized M- Elevations. M-Elevations are Mallard proprietary designs to enable you to visualize your carton flow solution before purchasing and ensure space optimization and ergonomic and efficient order picking. M-Elevations also help define an effective product/carton slotting plan, restocking schedule (peak or low activity times), and shelf heights. 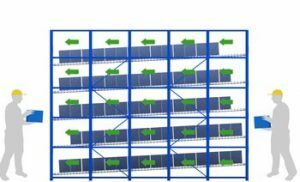 We can create 2-3 carton flow profiles to demonstrate various slotting options and establish the optimal cube utilization. Mallard manufactures the most diverse and flexible line of carton flow products in the industry. Our carton flow is designed to be tough enough to withstand rigorous daily use and still be nimble enough to accommodate frequent product mix changes. Contact Us today to perform your customized slotting analysis and optimal product configuration.